I keep circling back to this idea of a creative meeting place, a clubhouse if you will for people who enjoy collaborating, imagining, and colliding. Right now, there is no such place, rather an unpredictable collection of events and venues that bring people together. The CREATE Place is slowly forming in my mind, a grassroots gathering spot somewhere in the city centre, but tucked away, somewhat hidden, funky, authentic. I see a small stage, where local musicians can play, poets can recite and dancers can move. I see an oddball collection of sofas, easy chairs and hand-me-down dining chairs, arranged for conversations and creative collisions. I see coffee and end tables, created by our community of artists and artisans from repurposed materials, each containing a story and a message: we celebrate and encourage that which is unique, one-of-a-kind. I see bookshelves with an abundance of second hand and tattered titles waiting to be randomly read and borrowed - there will be no signing out policy in The CREATE Place. If a book doesn't return, another will take its place. I see classic arcade games up agains the wall, and gamers making brave leaps out of their darkened basements and experiencing human-to-human contact. I see local art on the walls, everywhere there is space, reaching all the way up to the ceiling. I see an intimate music concerts on a Friday night in front of an appreciative and organically gathered audience - no advertising necessary for The CREATE Place; people just show up. I see funky theatrical performances in this non-traditional space: intimate, cutting-edge, unexpected. I see emerging filmmakers showing their latest shorts in an adjacent multi-media room filled with old cinema seats purchased on eBay, useless to everyone else but perfect for The CREATE Place. I see painters and their easels doing their creative dances in amongst the fray, happy to be out of their cramped quarters and in this energized space. I see young people engaging with older folks, gamers hanging with musicians, poets mingling with dancers, and designers creating their latest masterpieces with visual artists offering their thoughts from across the room. 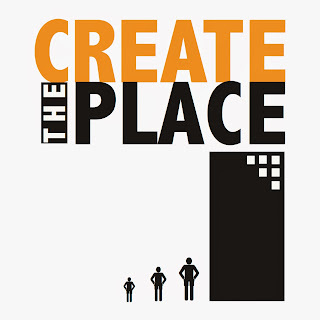 The CREATE Place will be home base for not one, two or four arts organizations, but for groups, large and small, who choose to meet, create, perform, rehearse, and learn here. Coffee will always be on the go, or tea for those who want it. The CREATE Place will be a little on the grunge side, but comfortable, clean, and safe. This will be the spot where new creatives arriving in our community get directed to. "You need to start at The CREATE Place," they'll be told. This is the entry point, the place of new beginnings and infinite possibilities, where if everybody doesn't know your name, they soon will.